How hot and dusty was it today... This hot and dusty. Selected by Scott Secco - This is a great example of photojournalism from Trumpore. I think it's quite clear what the story here is and it definitely captures the struggle of enduro racing! wait never mind, they're just as bad. @snoopy24777: sand in eyes can't be rubbed out easy, but a quick wipe with gloves will clean goggles enough so you can see. Goggle steam up or water condenses, even in hot weather. Don't they? @ondrugs: Yes they do, specially in a really humid climate. @TFreeman: My eyes have built in windshield wipers though - blinking doesn't require taking a hand off the bars. @ondrugs: those are the new smith squad googles designed not to fog up for mtb riders. @cptstoney: it's not fogged up. 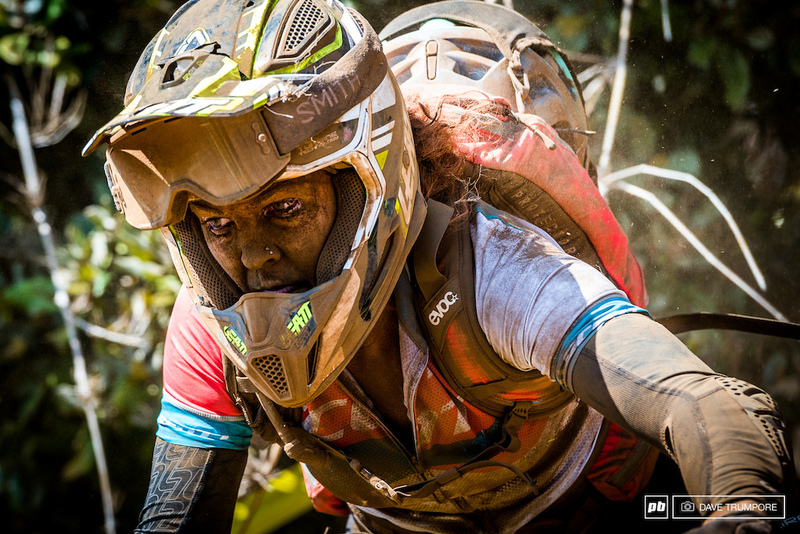 She crashed head first into a knee deep pile of dust during a race run and filled everything up with dirt. No time to clean off, just remove dirt filled goggles and carry on. Why is it everyone on here likes to go out of their way to try and dis products just for the sport of it without even knowing what are talking about? Those Smith goggles are amazing for riding. @davetrump: isn't that what @cptstoney said "...designed not to fog up..."? i was answering @ondrugs question/stating they don't fog by design. @cptstoney: not just fog; condensation. When I wear goggles in summer, the water collects distorts my vision. @ondrugs: wont collect since there is no foam so the water/condensation will just roll out the bottom. 10 years in the attic? What is the deal with two helmets? Does she really swap helmets for the uphill and downhill? Is there some requirement to wear a helmet while climbing? aaah the things we do for fun on the weekend! @davetrump: Thought I saw some red hair flowing from the helmet !